Never have old and rare whiskies been venerated and prized as they are today. 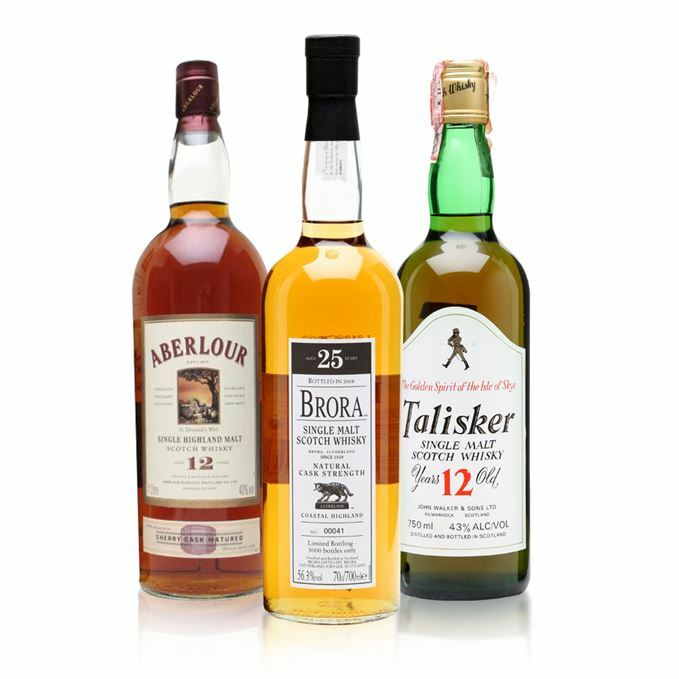 Witness the prices paid at auction, the huge sums that change hands in order to get hold of a special bottling produced decades ago by that favourite distillery. The expectation when opening these whiskies – assuming that they will, at some point, be opened – is of a special, even life-changing experience. And this is often the case – but not always. Sometimes it’s good to be reminded that not all ‘collectible’ whisky is great, and that old bottles can disappoint, whether in terms of the quality of the whisky, or the condition of the bottle. Anyway, these days, what is ‘rare’? 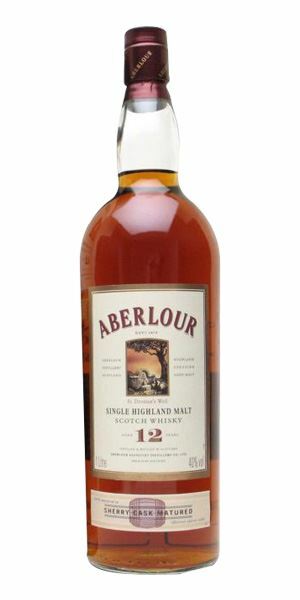 Our first whisky is an apparently run-of-the-mill oloroso Sherry cask-matured Aberlour, in the one-litre bottle so beloved of airport shops. A brief stay in travel retail means that this is now quite a rare beast – but is the whisky remarkable? We continue with a beguiling, elusive Brora that shyly takes its time to emerge – but what pleasures there are when it does! This, the seventh of the Brora Special Releases from distillery owner Diageo and bottled in 2008, was the first official 25-year-old expression from this much-missed closed distillery – only Port Ellen, perhaps, evokes more nostalgic regret among whisky fans all over the world. 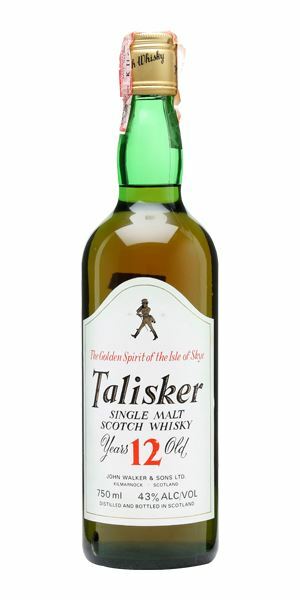 And then there is the Talisker OB 12-year-old from the 1980s – a whisky from a different age in so many ways: maturity (the 10-year-old has long since taken over as the Skye distillery’s core expression); alcoholic strength (43% abv, rather than the now customary 45.8%); and the packaging, complete with Johnnie Walker ‘striding man’ on the label. And the whisky? Sadly, on this occasion, a disappointment – a reminder that old bottles are fragile, living things capable of decay. No doubt about the Sherry cask here. Big and bold with very light funkiness and chamois leather. It is, however, chocolate which dominates and does so in such an all-enveloping way that just nosing this puts you into some sort of guilt trip (albeit a pleasurable one). It’s tempered, melted, nibs, ganache, brownie. Is it complex? Not really. It is appealing? Oh yes. Sadly, here it dies. There’s an odd, slippery quality to the spirit which seems to wriggle in a slightly fatty way along the tongue. The chocolate is there but, rather than the full blow-out you expect, it’s thin. A brief appearance in travel retail makes this rare in some sense. Promises much, delivers little. A quiet, almost understated Brora. It took an age for this to decide to start opening up. Some oiled paper, some seashore, a hint of new Neoprene, and then you are in an apple orchard. Water does open things up considerably with a gentle smoke (this is not, however, peaty), some nettles, lemon thyme and a light nuttiness. It all comes out here. Classical in frame, even if it is lighter than some might anticipate from this distillery. 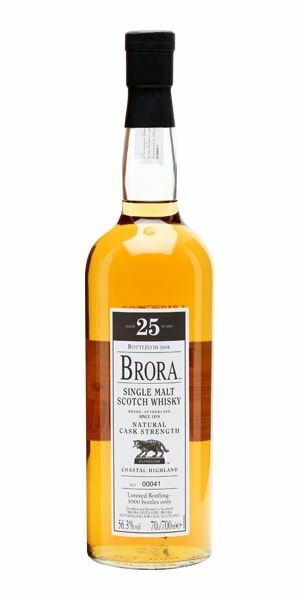 Here – again especially with water – Brora is in the glittering spring sunshine, mixing sweetness and acidity (those apples again), touches of bitterness (nutshell, green tree bark), smoke (tobacco-like) and citrus (candied lemon peels), the land and the shore. Refined, balanced and subtle. The one thing you can be guaranteed with Brora it is that it will confound you. The whisky will (mostly – there was a butiric phase) be fantastic, but what character will emerge? Kelp-garlanded Poseidon, wind-burnt sheep farmer, wistful heroine on the beach… you’re never quite sure until you taste. That, my friends, makes it fun. Mr Weller put it best (and even this isn’t what you expect). Foosty damp wood, a bucket of brine thrown over a peat fire, over-cooked razor clams, wet washing left too long in a wicker basket. In time there’s some shoe polish and tallow. Water destroys it. There’s enough Talisker-esque pear elements and citrus to allow expectation to rise. Then a hole appears in the middle of the tongue and all flavour vanishes. It then shakes itself back together to become peppery. Water? Really? A strange (low) strength for an official bottling of Talisker. I’ve had this before and it was superb. It would be therefore be easy enough to finesse the notes with thoughts from the past – for this is shot. If you see it, try it because when it’s good it’s very, very good, but this is a salutary lesson. Not all old whiskies are great and not all old bottles are either. This is a living – and breathing – product and in this case it’s breathed just a little too much. Sitting, drenched, in a bus shelter in Uig, with only a truculent sheep for company. Rare Batch 17 22/02/2017 A 17-year-old Cragganmore, 34-year-old Glenturret from Berry Bros and 25-year-old Rosebank. Rare Batch 15 03/01/2017 All Ardbegs, including two 27-year-old Old Malt Cask bottlings, plus a 32-year-old release.